Do you have some unexplainable dislikes for certain brands? I have never liked Physicians Formula and their products looked all very uninteresting and overpriced whether they were on sale or not. A couple days ago, I picked up this value set including Shimmer Strips Bronzer (Miami Strips) and Blush (Healthy Glow) only because the set was $2.99! I have to say I am quite impressed with the quality and this got me (finally) interested in other Physicians Formula products. I don't like striped products in general and for that matter, I dislike Bobbie Brown Shimmer Bricks and I was never excited about their ongoing additions to the line. I am pretty sure this is a nice dupe for more expensive Bobbie Brown ones, though. These are very finely milled and surprisingly apply very well with little of fallouts. The blush color is subtle and provides just a hint of flush that looks very natural. The lighter parts of the strips nicely work as highlighter. I like the bronzer even better although I am not a bronzer person at all. The golden shimmer is pretty under any light and the color is never muddy. This can be used as eyeshadows as well if you like warmer golden tones. 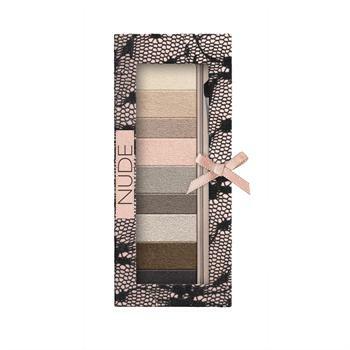 For example, I would be interested in buying this eyeshadow palette and wouldn't mind paying for the full price. I've never tried any Physicians Formula products - their shelves at the drugstore are always a mess! (Though it's probably only here) But I'm glad these work well and the packaging is looking better and better. wow that palette does look like UD's!! huh! but for $2.99 for both, i couldn't find any reason not to get it. oh, i am glad i wasn't the only one. lol. i was lucky to find them at a price so cheap like that otherwise i would have never known. Yeah, I noticed a lot of Physicians Formula packaging aren't that adorable. I do like mood boosting with the hearts. :) Thanks for the review. here in the u.s. it's pretty much everywhere. one of the core drugstore lines. i also see they have separate sited for canada, south africa and australia. oh, i just visitied your blog and i see you review on this very palette! off i go to read some more. Wow, that's really cheap! I had their healthy glow, but have yet to try it. Hehehe. And the palette looks good! You should buyyyy. Hehehe! ah so it is available there! hope you find the pink blush as well.